The EZ Port Max is the first lift to be modular for multiple configurations to fit your needs. Adaptable to accommodate varying waterfronts, watercraft & anchoring needs, & finally, expandable to allow for in-line tandem porting. 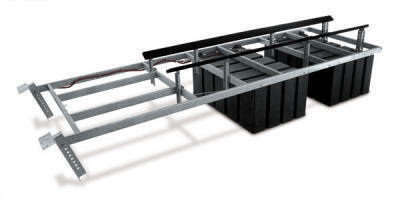 Unit can be attached to existing EZ Dock dock, connected to traditional fixed docks, or freestanding. Large walking surface for easy maneuverability around the PWC. Low entry roller for easy approach & softer entry. Higher, wider hull to accommodate newer, wider, & heavier PWC. Easy roll on & roll off. Guide roller aligns the watercraft. Premium quality, heavy duty side rollers. 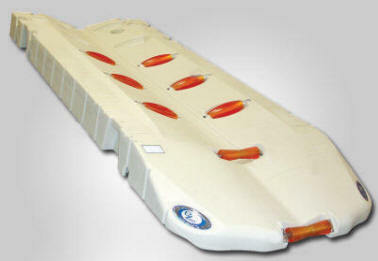 Molded-in pontoon provide excellent stability. Molded bow stop with tie-down cleat. 2 Mounting styles--Hoop Mount Kit: slides over pilings, Hinge Mount Kit: attaches to dock with bolts or lag screws. Frames are welded, not bolted for greater strength & durability. Heavy duty, UV protected polyethylene floatation tanks. Top-mounted float tanks keep all metal parts & hardware out of the water in the lift's raised position. Adjustable, marine carpeted bunk systems.